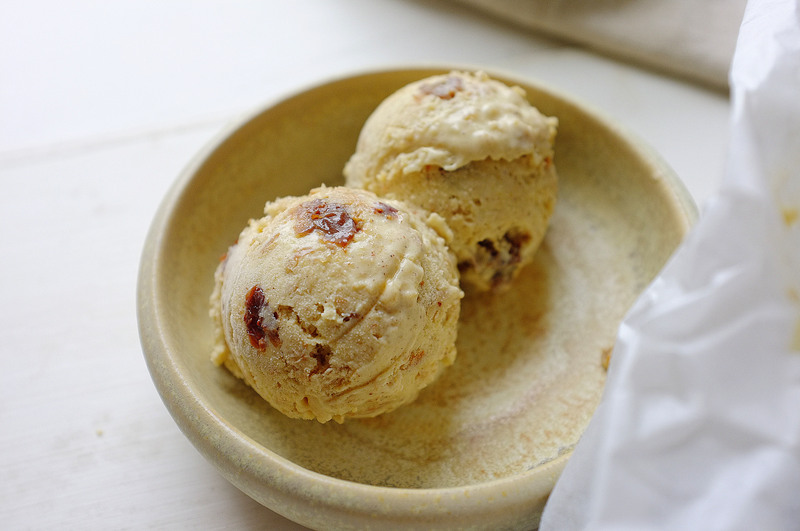 We’ve been enjoying a very unusual bout of beautiful hot weather here in the UK, so today’s recipe is an iced one. 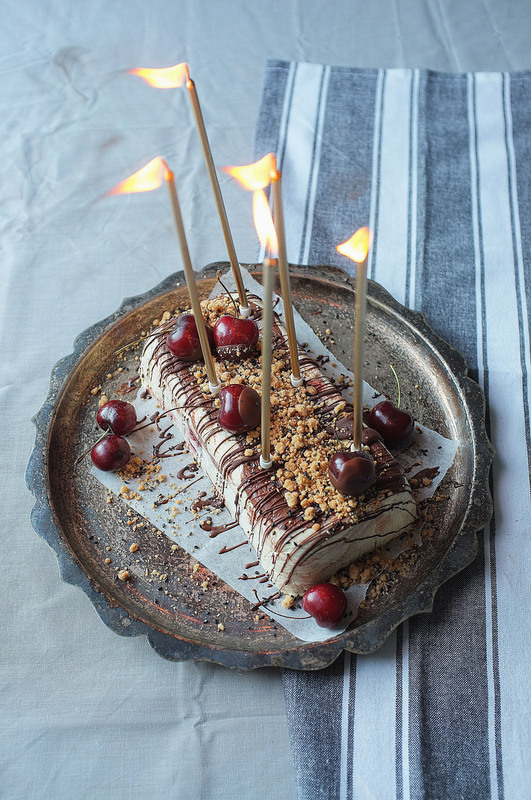 I served this up for my boyfriends birthday (after he broke the news to me that he didn’t want a cake- yeah, sacrilege I know) and although it requires a little more effort to make than a simple sponge, the creamy, indulgent and slightly bittersweet (thanks to the tahini and very dark chocolate) result is well worth it. Start by making the chocolate ganache for the ripple. To do this simply place the chocolate, salt and cream in a heatproof bowl and set over a pan of simmering water (don’t allow the water to touch the bottom of the bowl). Stir occasionally until it melts together and forms a smooth ganache. Set aside to cool. Now prepare the cherry compote. Put the cherries, honey (or sugar), orange zest and juice in a saucepan and gently heat, stirring occasionally, until it reaches a sticky compote consistency (5-10 minutes). Transfer to a bowl and leave to cool. Now it’s time to make the parfait base. Line a loaf tin with 2 layers of cling film, leaving an overhang on all sides. Separate the eggs. Put the yolks in a large bowl along with the sugar and whisk until pale, meanwhile, heat the milk until just boiling in a saucepan. Remove the milk from the heat and pour into the egg yolks, then stir together until smooth. Return the mix to a clean pan and gently heat, stirring constantly. After a few minutes, the mix will start to thicken- once it coats the back of the spoon set aside and cool to room temperature. Once the ganache, compote and custard have cooled to room temperature, whisk the double cream to soft peaks. In a separate bowl whisk the egg whites to medium peaks. Stir the tahini into the egg yolk mixture. Fold the double cream into the egg yolk/ tahini with a large metal spoon, then do the same with the egg whites, retaining as much air as possible. Ripple through 2/3 of the chocolate ganache and 2/3 of the cherry compote. Spoon the remaining chocolate ganache and cherry compote into the bottom of the prepared tin, then spoon in the parfait mix. Cover with cling film and freeze for at least 4 hours. 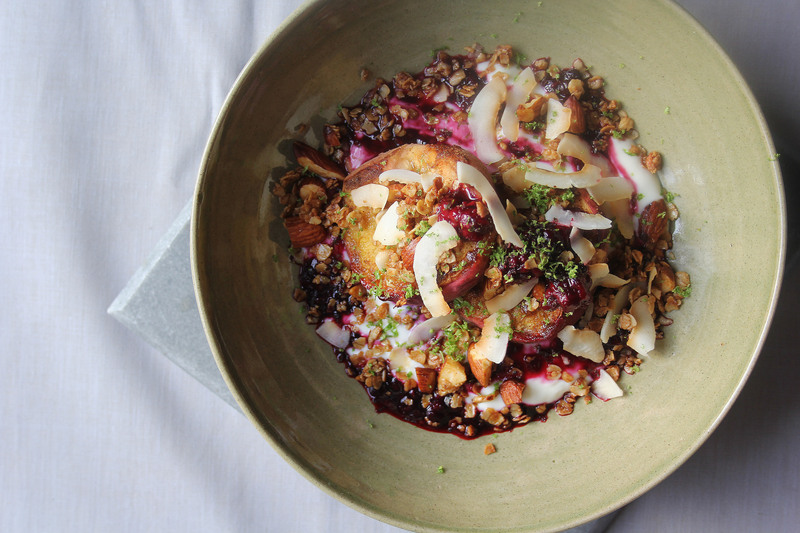 While the parfait is freezing, make the sesame crumble. Preheat the oven to 180c. Rub together the butter and flour until they resemble breadcrumbs. 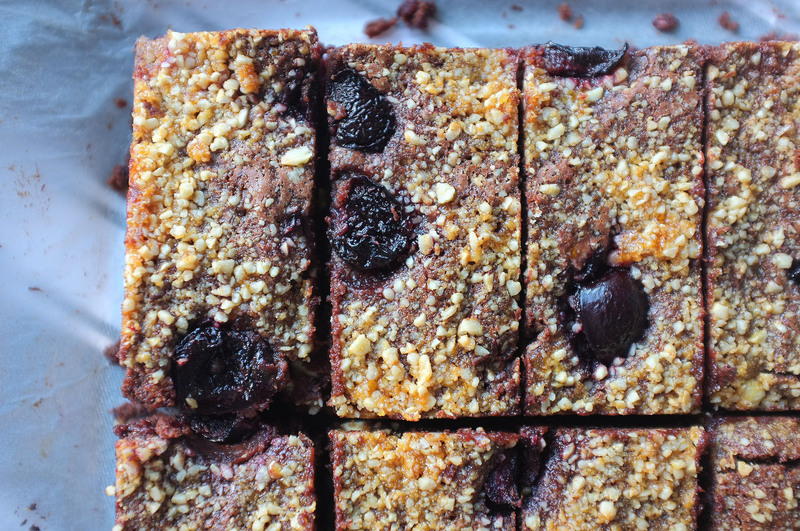 Stir through the sugar and tahini, then tip onto a lined baking tray- bake for 10 minutes then check, shake and return to the oven to 10 more minutes, or until the crumble is golden brown. Stir through the sesame seeds and set aside to cool. 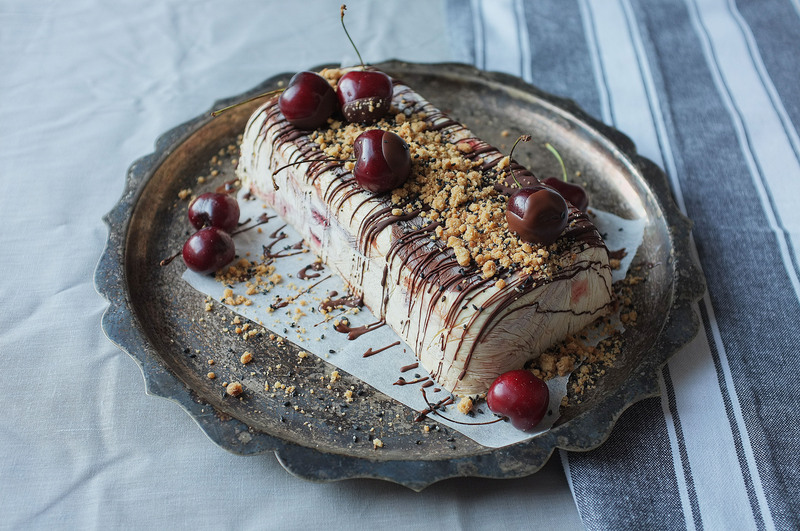 Take the parfait out of the oven 10 minutes before you’d like to serve it to allow it to soften slightly. 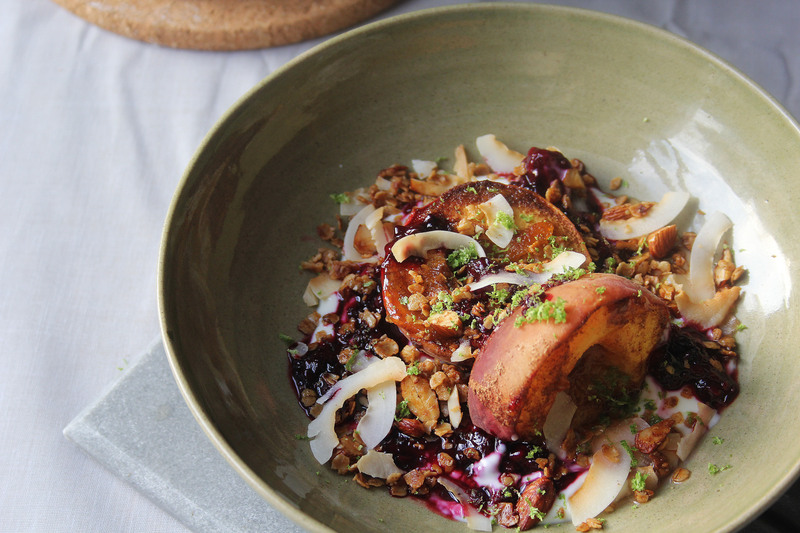 Sprinkle on the sesame crumble and finish with some fresh cherries. 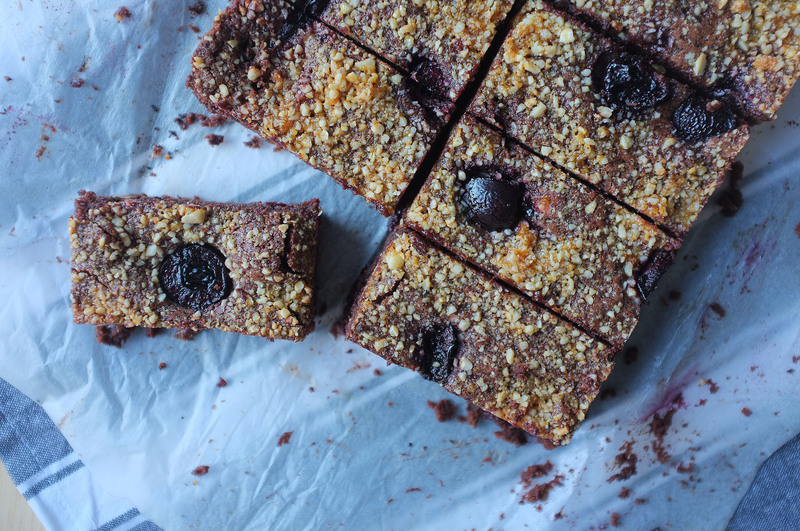 Make the most of the fleeting cherry season with this deliciously indulgent ode to my favourite things (chocolate and cherries). 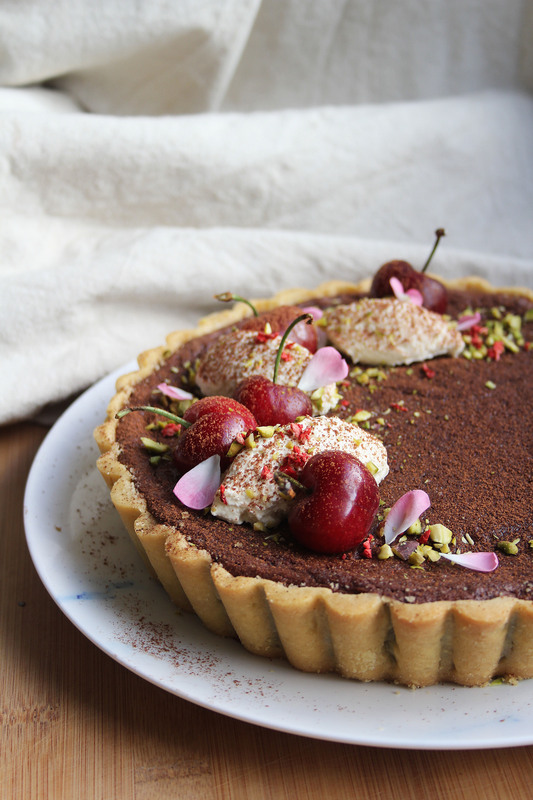 Great for a summer dinner party dessert or post-BBQ chocolate fix, this tart layers up cherry compote, orange blossom infused chocolate filling and cardamom cream, all encased in crisp, zesty pastry; you’d be hard pushed to find someone who’d turn down a slice. Grease a 20cm deep tart tin lightly with butter. Before you make the pastry, flavour the cream for the chocolate filling. To do this just pop the double cream, butter, orange zest and orange blossom extract in a saucepan and heat until the butter has melted and starts to gently simmer. Set aside until required. Place the plain flour, butter and salt in a food processor and whizz on a pulse setting until they resemble breadcrumbs. Tip this mix into a large bowl and stir through the caster sugar and orange zest. Briefly whisk together the egg and egg yolk and add to the bowl then stir with a cutlery knife to form pastry. Once it all comes together in big lumps, shape it into one large disc (handling as little as possible) and wrap in cling film. Chill for about an hour or until the pastry is a little firmer. Preheat the oven to 180c. While the pastry is chilling, make the cherry filling. To do this just place the de-stoned cherries, caster sugar, orange zest and juice, and the cherry molasses (if using- this is optional but it really helps intensify the cherry flavour) in a saucepan. Heat gently until the cherries release their juices, then up the heat and cook, stirring occasionally, until the cherries are sticky and resemble a compote. Once the pastry has firmed up, roll out to about 3mm thick on a well floured surface. Line the tart tin with the pastry, ensuring that you push it into the corners and flutes. Trim any overhanging pastry and chill for 20 minutes. When your pastry is sufficiently chilled, line with baking paper, fill with baking beans and blind bake for 10-15 minutes until the walls of the tart case can support themselves. At this stage remove the paper and beans and return to the oven for a further 5-10 minutes or until the pastry is completely cooked through with no grey, raw areas of pastry remaining. Set aside. Now make the chocolate filling. Gently melt the chocolate in a heatproof bowl set over a pan of simmering water. Meanwhile, remove the orange zest from the cream mixture and heat up. Once the chocolate has melted pour the cream into the bowl and briefly stir to combine, then set aside to cool a little. Put the egg, yolks and caster sugar in a large bowl (or bowl of a stand mixer) and whisk until very thick, pale and voluminous (5-6 minutes). Add a large spoonful of this to the chocolate and mix in, then add the rest and carefully fold. 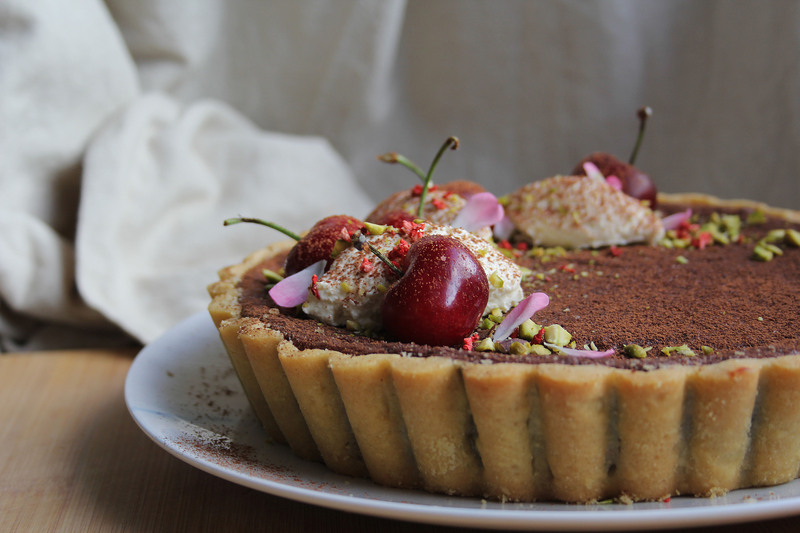 To assemble the tart, tip the cherry compote into the pastry case and spread out in an even layer, then scrape the chocolate filling on top. Bake for 15 minutes then leave to cool completely in the tin (it should have a little wobble). 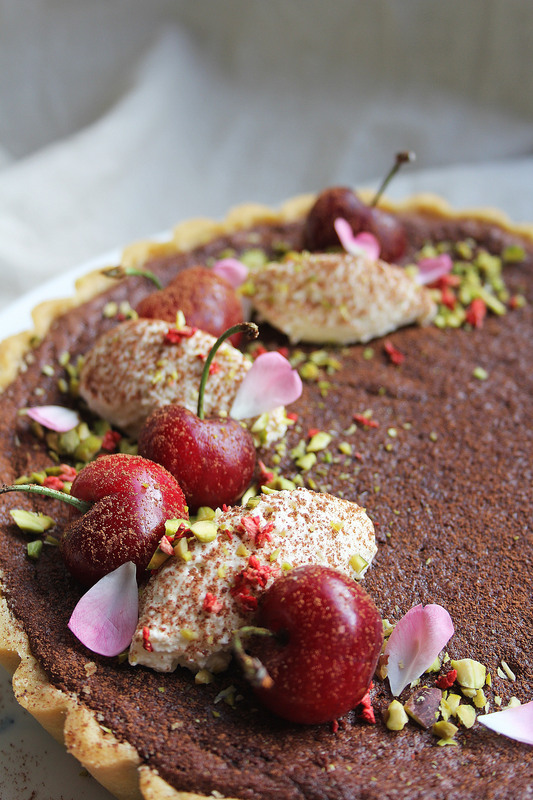 While the tart is cooling, make the cardamom cream. 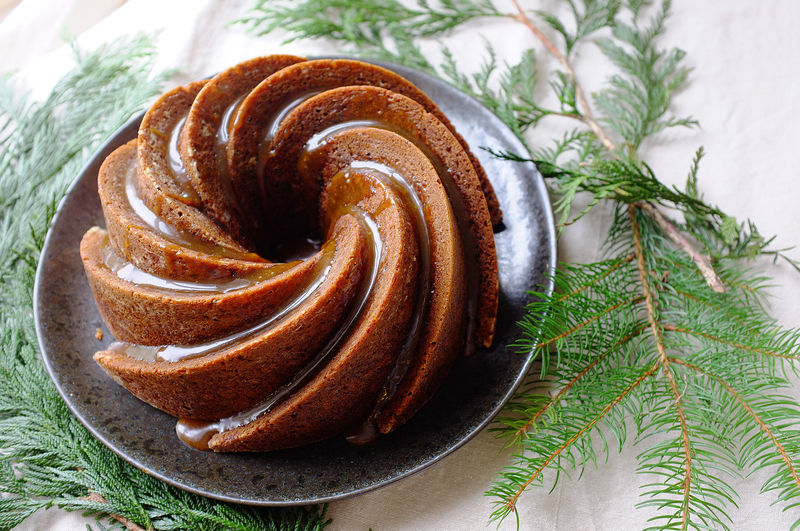 To do this simply whisk together the icing sugar, cream and ground cardamom until soft peaks form. You can enjoy the tart at this stage- it will have a very fudgy, mousse like texture. 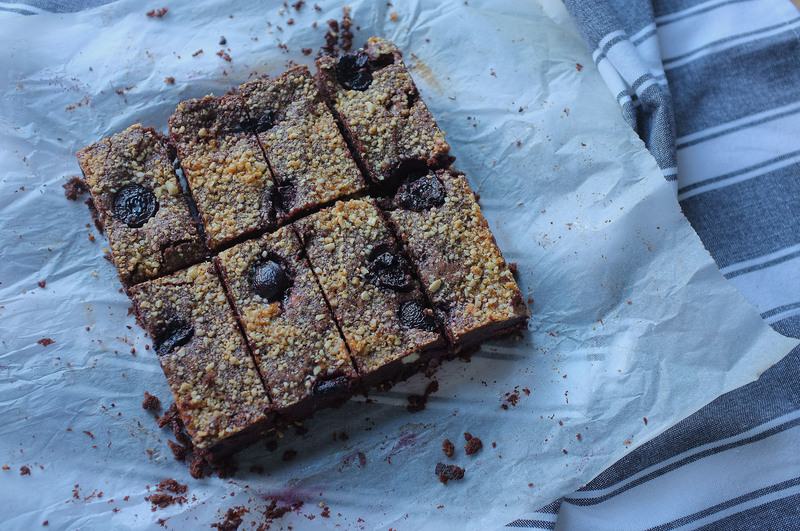 If you chill the tart it will have a slightly different, but still delicious, texture (the cold will set it a little firmer, like a conventional chocolate tart). 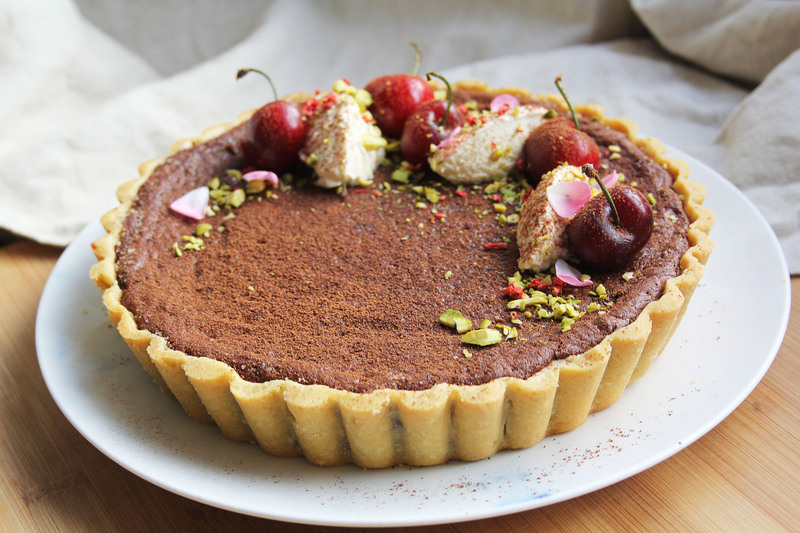 However you serve your tart, top it with a spoonful of cardamom cream and fresh cherries. 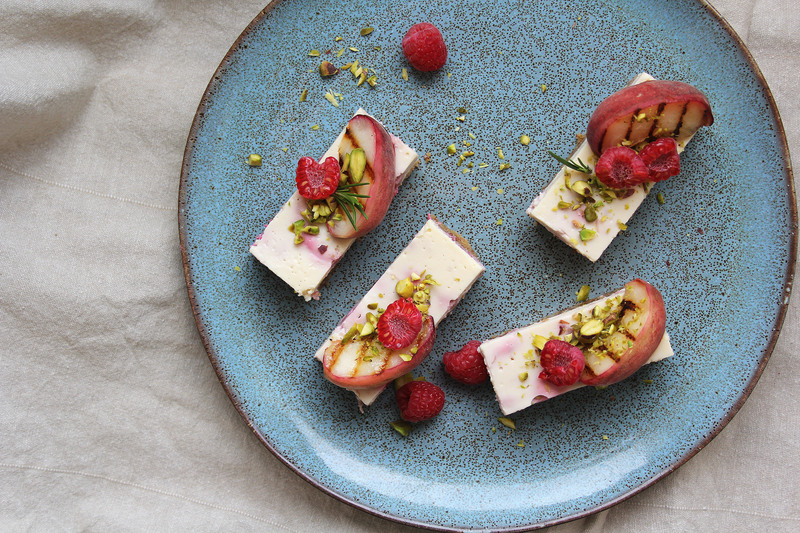 With a light baked ricotta filling studded with fresh raspberries, crunchy almond-oat base and griddled peach topping, these cheesecake bars pay homage to 90s peach melba, and make for the perfect summer dessert. Preheat the oven to 160c and grease and line a 22x22cm baking tin. 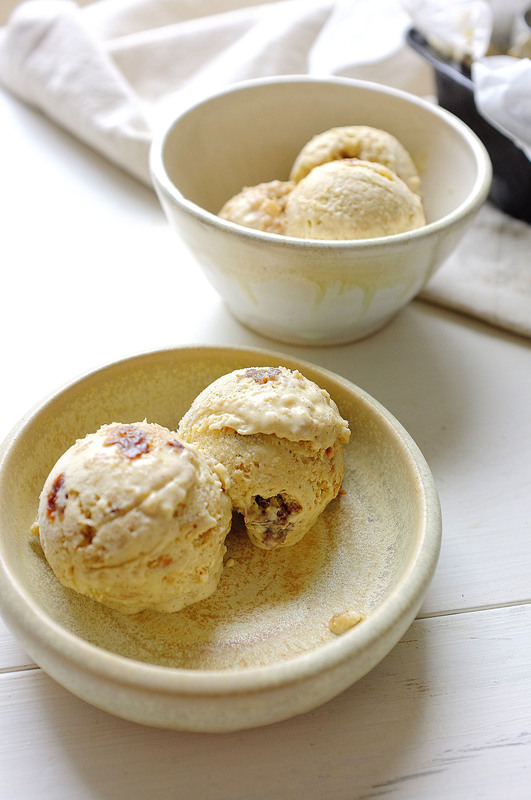 Place the digestives, demerara sugar and cinnamon in a food processor and blitz into crumbs. Add in the melted butter, almonds and oats and very briefly blitz again to combine- don’t over mix here, you want a nice crunchy base. Tip this mixture into the prepared tin and pack down with the back of a spoon. Chill for 15 minutes then bake for 10 minutes to set. Once baked set aside for later. Now make the filling. To do this simply whisk together the ricotta, golden caster sugar, corn flour and vanilla until very smooth, then add in the egg and egg yolk one at a time, whisking between each addition to bring the mixture together again. Lastly, whisk in the yoghurt. Roughly break up the raspberries with the back of a fork and tip them in. Ripple them through then scrape all the filling onto the base. Place the tin into another larger roasting tin and fill with water (about half way up the sides of your baking tin). Bake for 1 hour or until the cheesecake is set but still has a uniform wobble. 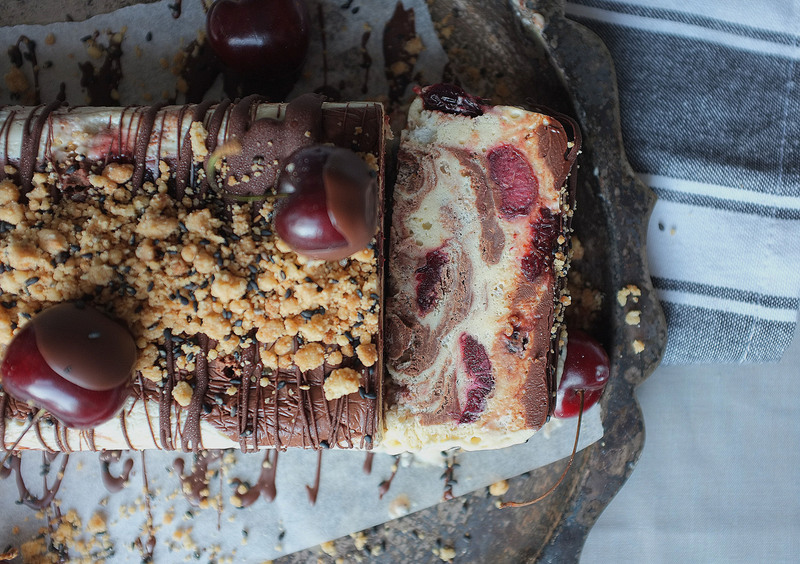 Once baked, leave the cheesecake to cool completely then chill for 4-6 hours to set. While the cheesecake is chilling, lightly oil a griddle pan and slice the peaches into wedges. Heat the pan and char the slices on each side, then leave to cool. 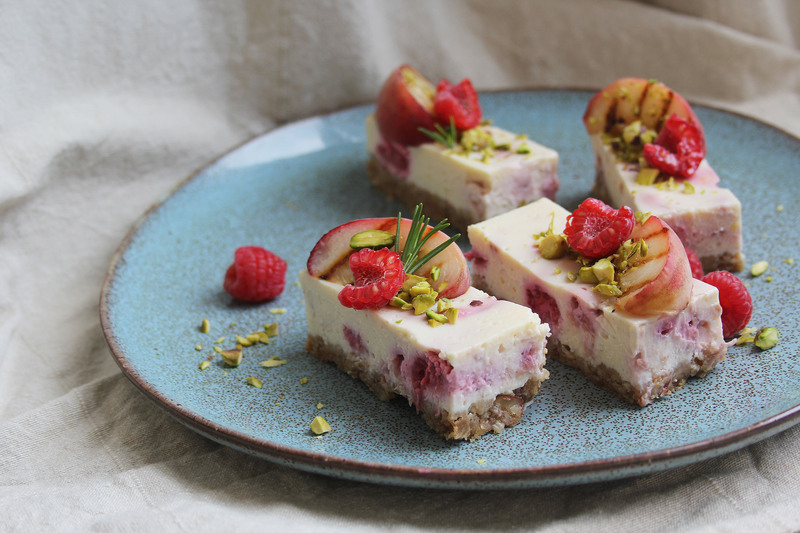 When your cheesecake has set, just remove it from the tin, slice into 12 bars (use a hot knife for this and you will get a cleaner result) and top with the griddled peach slices, extra raspberries and nuts. 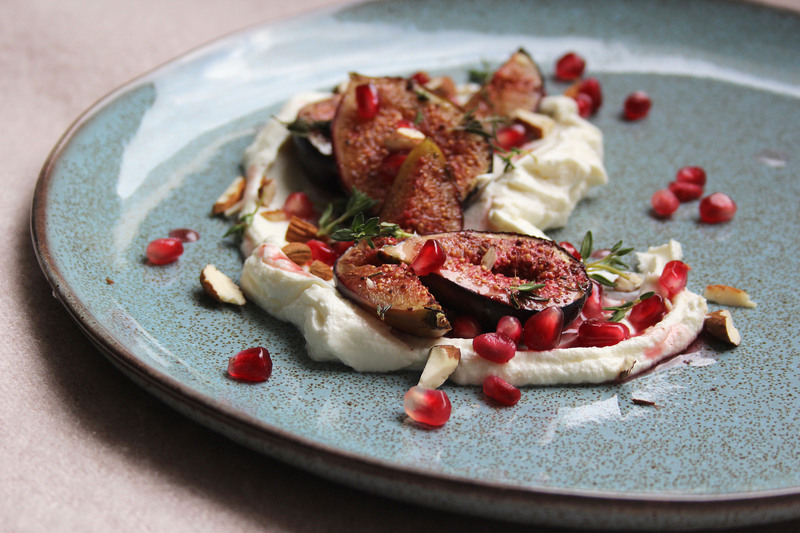 I know I’m getting a few months ahead of myself by posting a fig recipe (usually they come into season around late July), but when I saw some particularly plump, dark looking figs in my local fresh produce shop, I couldn’t help but cook them up with some delicious accompaniments. 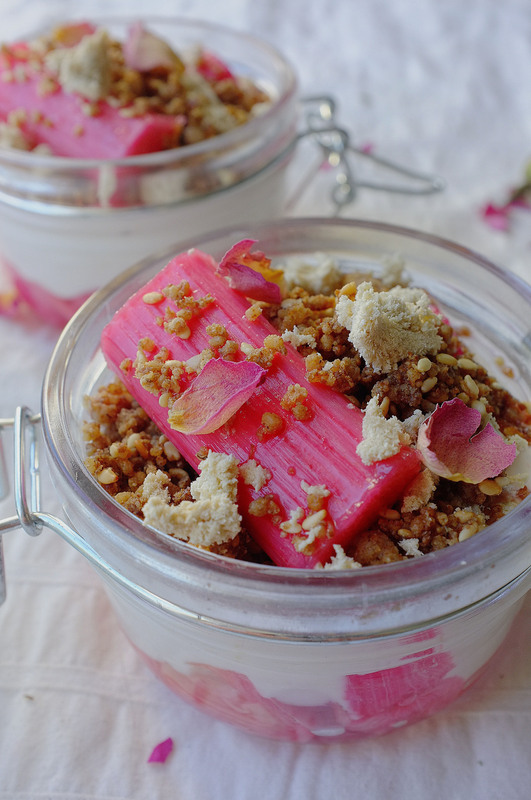 You could recreate this super simple recipe using any seasonal fruit- rhubarb, greengage or peach would work particularly well. Place the yoghurt, 1tbsp of the honey and the rose water in a bowl. Mix together then transfer to a muslin cloth and tie up the corners. Sit this in a sieve over a bowl for at least 24 hours (refrigerated). After 24 hours the liquid will have drained from the yoghurt, leaving you with a thick, smooth labneh. 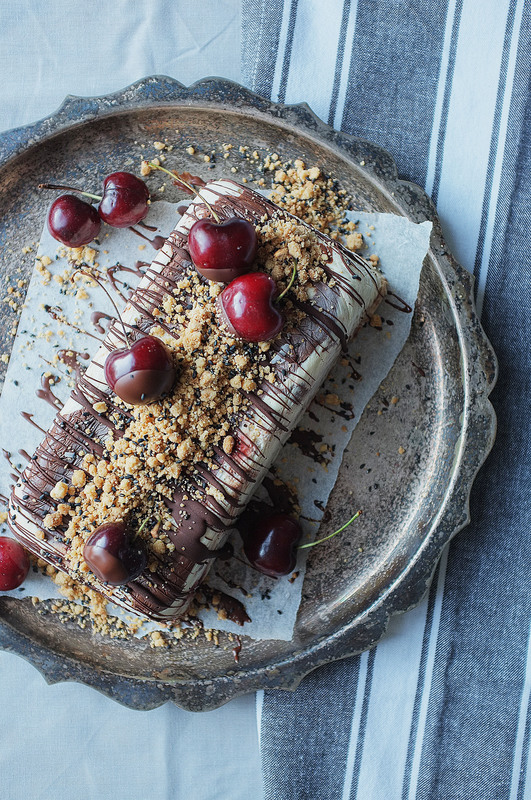 Once the labneh is ready, prepare the other elements of your dessert. Preheat the oven to 200c and line a high sided baking tray with greaseproof paper. Slice the figs into either halves or quarters (depending on your visual preference!) and spread out on the tray (cut side up). Drizzle with the remaining 2tbsp honey and sprinkle over the sumac. Roughly break the thyme into the tray too. 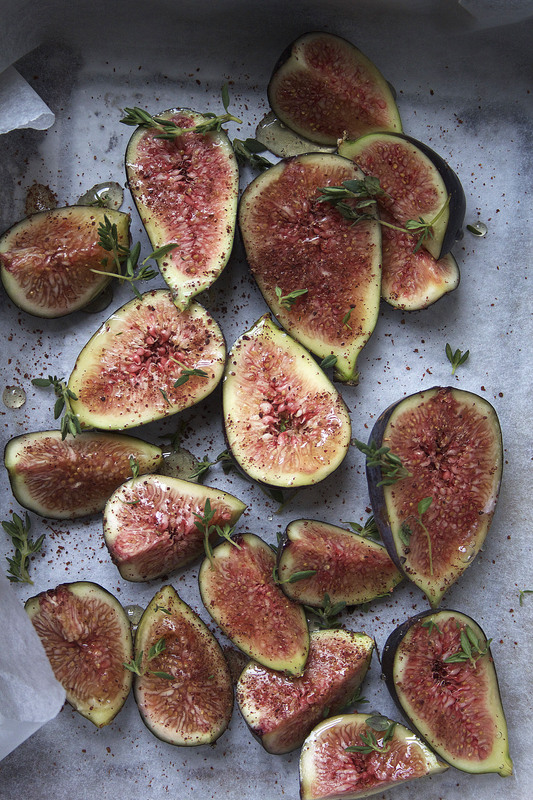 Roast the figs for 20-25 minutes until very tender and sticky. 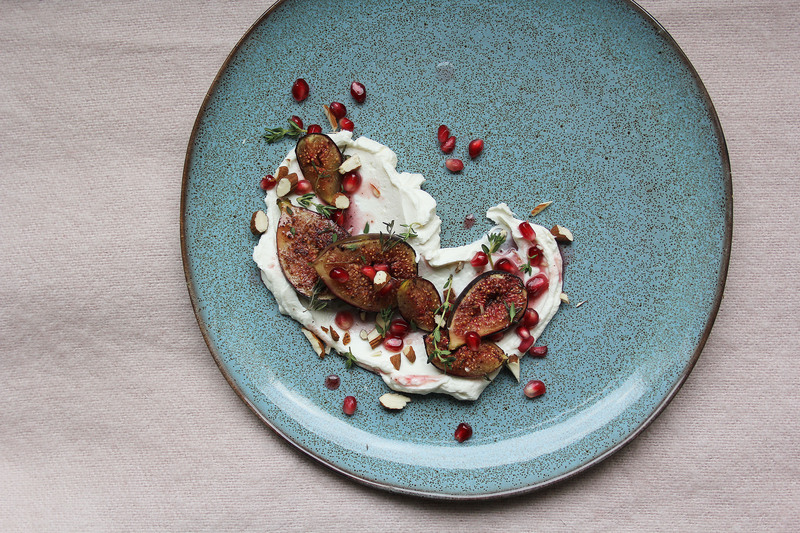 While the figs are cooking, toast the almonds in a dry frying pan until lightly coloured, then roughly chop. 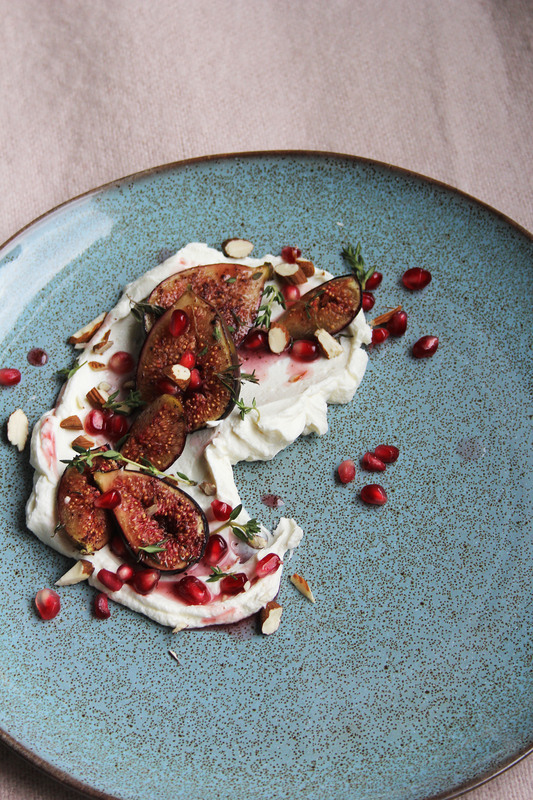 To serve, spread a generous spoonful of the labneh onto your dessert plates and arrange some fig pieces on top. 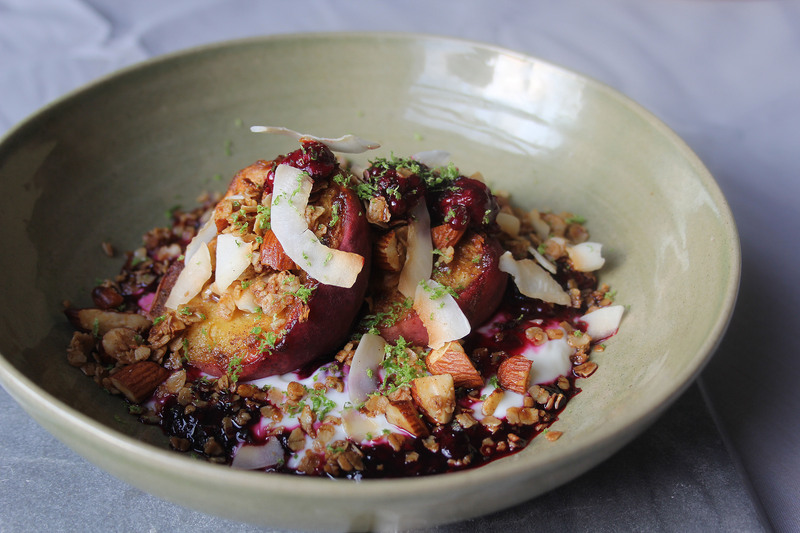 Sprinkle over the almonds and pomegranate seeds and lastly, garnish with some thyme, if you like. 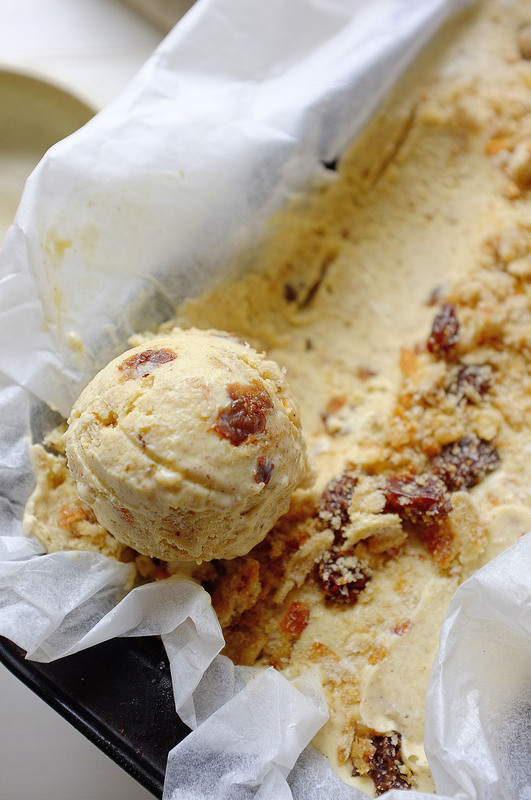 I’m kicking it old school today with a seasonal take on a childhood classic; baked custard. Custard is something which, until a few years back, filled me with dread. I think it has something to do with enduring memories of school puddings accompanied by lukewarm, thick skinned, unsettlingly lumpy custard… That said, a good baked custard I had at cookery school a few years back converted me after years of avoiding the stuff; it was deliciously smooth, creamy and comforting and since then I can appreciate how the simple format can make for a really versatile dessert. 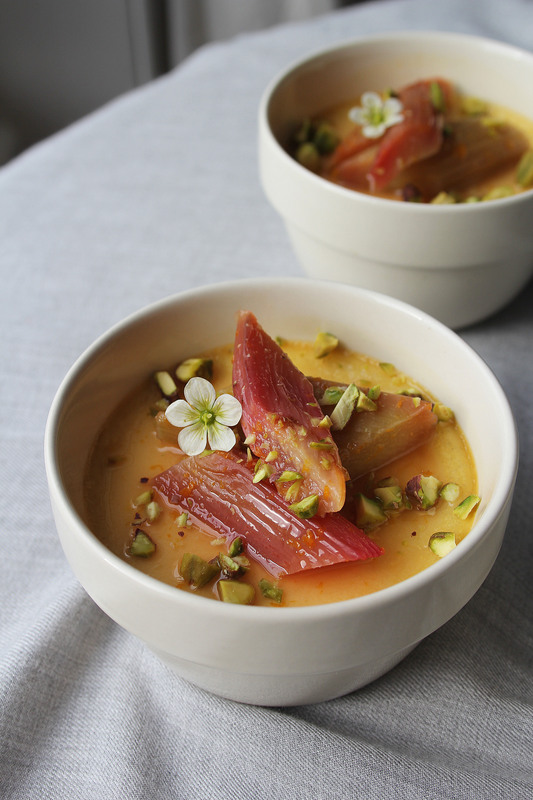 In this spring recipe I’ve flavoured the custard with cardamom and paired it with some orange blossom roast rhubarb and pistachios for added texture. 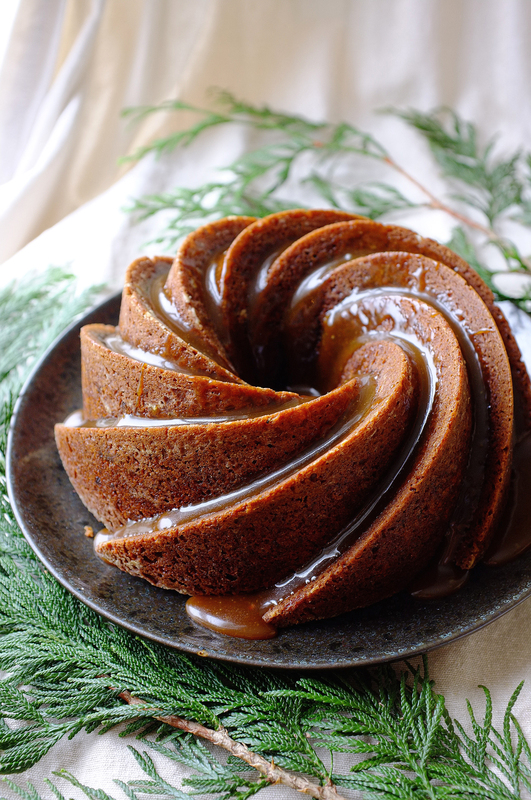 Once you’ve made it once though you’ll definitely want to play with other flavours. Coffee, chocolate, citrus, rose and almond are just some flavours you might like to try, but the possibilities and accompaniment choices are endless. Whisk the eggs and sugar together to combine. Heat the milk, cream, vanilla and ground cardamom seeds in a saucepan to just below boiling point then leave the flavours to infuse for 10 minutes. Bring the cream mix back up to scalding point then pour it all over the eggs. Whisk to combine then strain through a sieve into a jug. Distribute the mixture between four individual oven proof serving dishes. Place the dishes into a deep roasting pan and fill with enough boiling water to come halfway up the sides. Bake for 25-30 minutes or until the custards are almost set but have a gentle, uniform wobble in the middle. 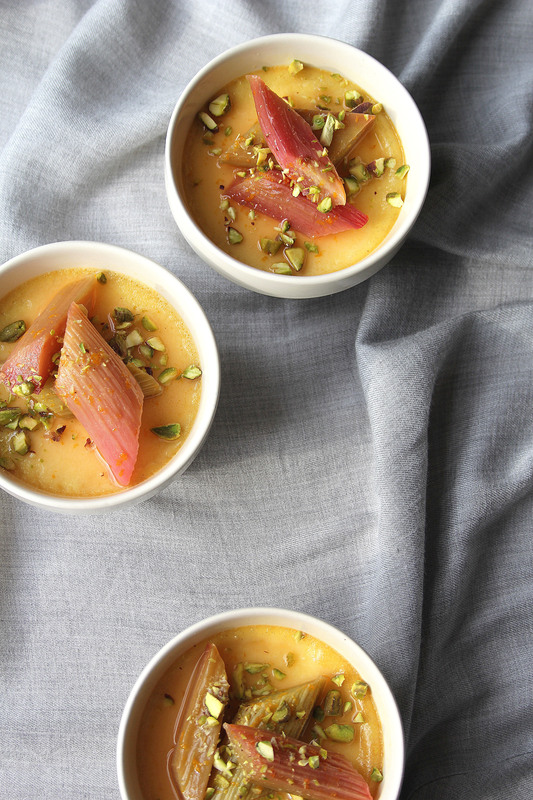 The custards can be served warm or cold, so depending on your preference you might like to prepare the rhubarb and pistachio topping before baking the custards. I personally like them cold so once they’re cooked just take them out of the water bath to cool completely. Once cooled you can refrigerate the custards until required. Meanwhile, up the temperature of the oven to 180c. 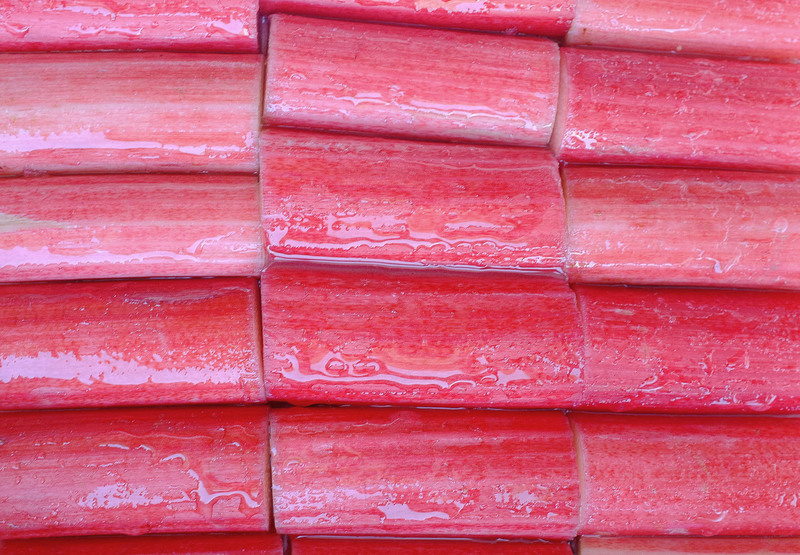 Place the rhubarb in a bowl along with the sugar, orange zest, orange blossom water and orange juice. Toss to evenly coat then tip everything onto a lined baking tray and roast for 10-15 minutes. When it’s done the rhubarb will be tender but hold its shape. 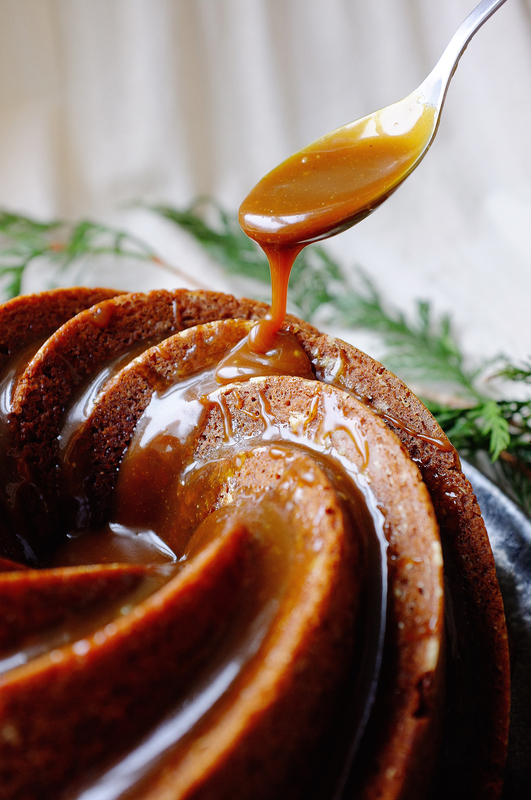 Set aside to cool and make sure you reserve the delicious cooking syrup. Last of all, roughly chop the pistachios. 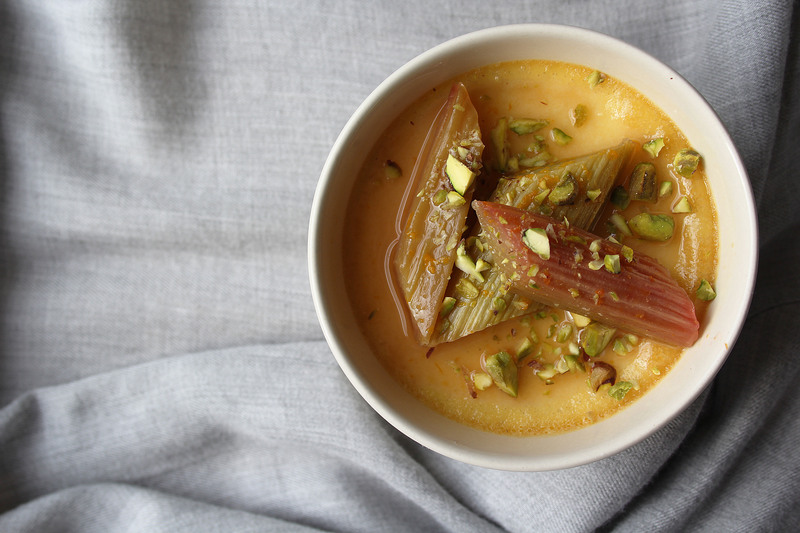 To serve, top the custards with a generous spoonful of roast rhubarb and some of the orange syrup. 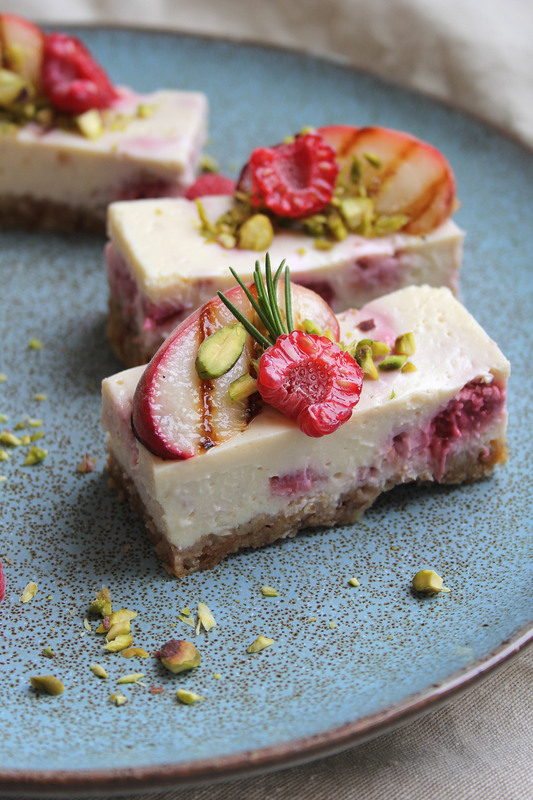 Sprinkle with chopped pistachios and enjoy!